There is a widespread dissatisfaction among House and Senate lawmakers – conservatives and moderates alike – with the recently published Republican health plan “American Health Care Act’ ( ACHA). The recently released analysis of the Congressional Budget Office has predicted that 14 million fewer Americans would be insured in 2018. The likelihood that the Affordable Care Act (ACA- Obamacare) will be repealed is actually low, because a true repeal requires that both the House and Senate will have to approve it. While the Republican House might vote for the ACHA plan, the likelihood that the Senate will have the necessary 60 votes for the new ACHA plan, under this current political situation, appears almost impossible. The Republican lawmakers would have to convince 8 Democratic lawmakers to vote for the Republican Health Care Act. What this means is that instead of a complete repeal, a modification or reconciliation of the Affordable Care Act is much more likely; however, it will need to be a bipartisan compromise. Many Americans agree that the current ACA health plan has to be modified. Issues such as fewer doctor choices, higher premiums and higher out-of-pocket maximums have occurred under the existing ACA health plans. Certain states such as Tennessee, Minnesota and Texas have been hit much harder than states like California, where there is more competition among the insurance carriers and more available choices for Californians. Many agree that the soaring Medicaid population is unsustainable for the Federal Government. Since the implementation of the ACA and the expansion of Medicaid to those with a 138 % Federal Poverty Level, the number of Medicaid Holders soared in California 57 percent. Now every third person in California is on Medicaid. This includes half the babies born, plus half the aging population which is on Medicaid for long term care needs. If you remove one of these 3 elements the system will collapse, it cannot sustain itself. To visualize an affordable care plan, think about a 3 legged table-… if you remove one of the legs the complete system will fall. What would a reconciled or modified Affordable health care plan look like? Subsidize Individuals – instead of a subsidy to assist with the cost of the premiums, a tax credit will be given – the exact details will have to be worked out bi-partisan. In reality, if the monthly health premiums are too high, policyholders cannot afford to wait until tax time to receive the credit; they will drop out of the system. So something has to be created to help those individuals. Individual Mandate – The individual mandate will fall away, however there will be a 30 percent premium penalty for the first year someone buys a new health insurance premium, who did not carry health insurance previously. This helps insurance carriers recover part of their losses. However, it also might keep young policy holders away, as they are not willing or able to pay the 30 % increase and just rather go to the Emergency Room where they are required to be treated. Insurance Reform – Removal of the Employer Mandate to offer health insurance and removal of the requirement of the 10 Essential Health Benefits, which allows insurance carrier to offer leaner health plans versus current standard ACA health plans. Removing the 3:1 age band to a 5:1 age band will offer lower health insurance premiums for younger policyholders but will cause a sharp premium increase for older policyholders. What does all this mean for 2018 in the health insurance industry? 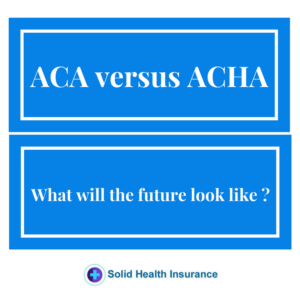 It is expected that the House will vote for the current ACHA plan by April; however, there will not be a Senate approval and uncertainty will dominate the health insurance market. By May 2017, the insurance carriers need to announce their health insurance premium for 2018. It is very likely that the mathematicians will calculate the uncertainty and loss of policyholders into their calculations. For that reason many experts estimate for 2018 a 15 to 20 percent health increase in health insurance premiums for 2018. Unfortunately, in all this health care reform review, no one has even made an attempt to reduce health care costs. In this era of information technology, it should be possible for Americans to review online pricing for standard health care procedures in their region and to review the costs of prescription drugs and possible generic alternatives. The more transparent the health care market is to the consumer, the greater the likelihood that consumers will use health care wisely, which would have the consequence of helping to keep health insurance premiums in control. Solid Health Insurance Services’ suggestion for 2017 is, that those Californians who currently have a Silver, Gold or Platinum Plan should use their insurance. You should take advantage of your preventive care exams and do not postpone medical treatments. In the current system policyholders know how much their out-of-pocket maximum will be and unforeseen surprises of medical costs are limited due to the standardized and regulated health plans of the Affordable Care Act, aka Obamacare.